Gut-wrenching pains woke me up in the wee hours and tormented me most of the day. I accomplished nothing I intended; even a good rest evaded me. 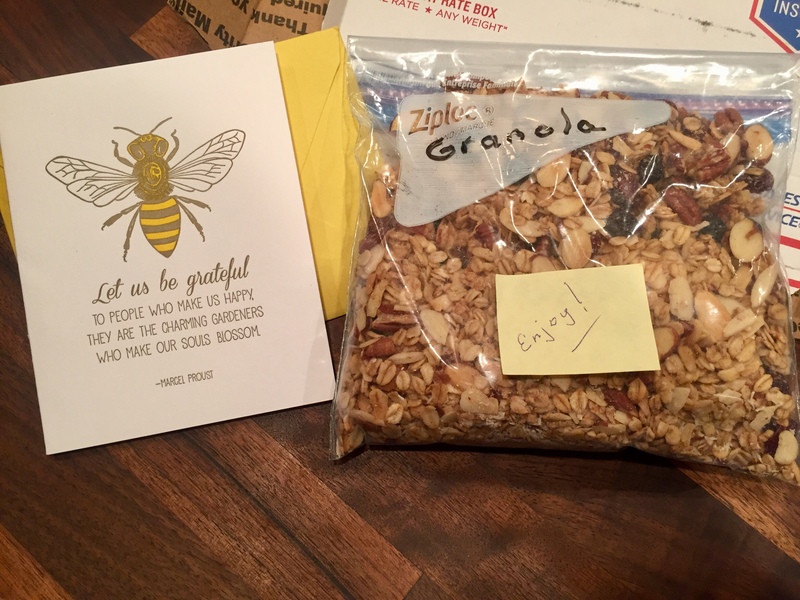 But the day got better when the mail arrived with a heartwarming card from one of my besties, and a package of homemade granola from one of Mama’s besties, More Diane, who just visited us (and told us about her yummy breakfast treat). Today’s #OneGoodThing was receiving mail from our besties with Mama! Many thanks to Diane and Angelina for making us feel loved today! Day 307 of 365. And Day 1,038 in a row (here’s the first 366 & the following 365)! 2 years ago today: Our Abby calendars arrived! I hope you have abettwr day tomorrow. Proust is all very well, but yesterday my daughter was stung on the knee by a bee as she was riding her bike. I hope that you have a better day tomorrow, too. Ouch! That’s terrible! I still remember being stung by a bee when I was a kid. I had an allergic reaction and we had to leave our campsite to find an urgent care doctor. I hope your daughter feels better!!! Thanks Robin! Sending big hugs!! !